NFA Myths: Do you have to be 21 to buy NFA items? | The Law Office of John Pierce, Esq. ← NFA Myths: Did I agree to 24/7 warrantless inspections? NFA Myths: Do you have to be 21 to buy NFA items? In fact, the National Firearms Act (NFA) does not speak to age at all. 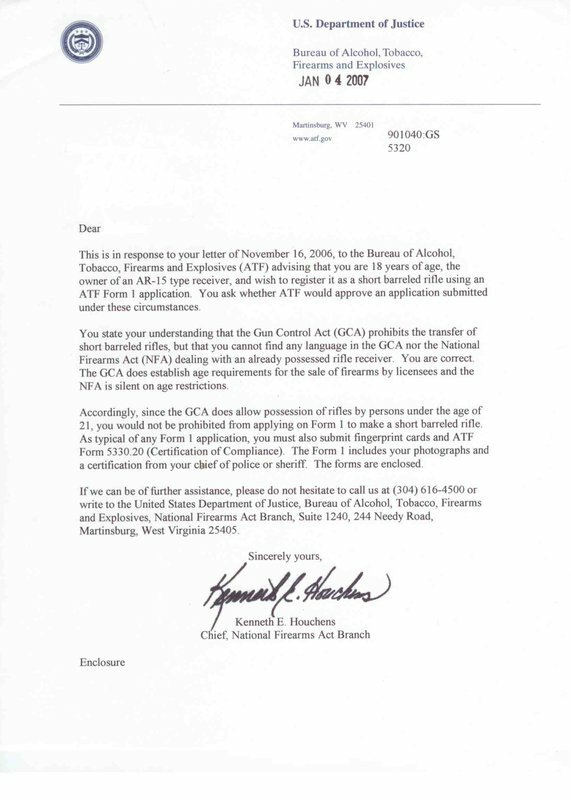 The Gun Control Act of 1968 (GCA) does impose a minimum age of 21 in order to purchase NFA items but only when the purchase is being made from a licensed dealer. This leaves a number of ways for someone who is at least 18 years of age, and who is not otherwise prohibited from possessing an NFA item under state law, to legally acquire NFA items. They may acquire them in an intrastate transfer from an individual, trust, or non-dealer corporate owner. Having said that, even in jurisdictions where the CLEO is NFA friendly, you might have trouble getting the CLEO to signoff for an 18 year old. So I would definitely recommend using an NFA trust. They may manufacture an NFA item (such as an SBR) using a lower receiver that they legally own. The ATF has actually issued a determination letter on this topic. They may acquire them as part of an inheritance. This would generally occur on a Form 5. Owning an NFA item is a serious responsibility and many NFA trust clients still direct their successor trustees to not distribute to beneficiaries until they reach the age of 21. But that is a matter of the settlor’s wishes and not a prohibition built into federal law. Disclaimer: This information is presented for educational purposes only and does not give rise to an attorney-client relationship. Additionally, I am licensed to practice law in the Commonwealth of Virginia and this answer may not be appropriate for other states. You should always consult an attorney licensed to practice law in your state who is familiar with NFA trust planning before making decisions about your own estate plan. This entry was posted in ATF, BATFE, Estate Planning, Form 1, Form 4, NFA Trusts. Bookmark the permalink.